Charts are spread across the kitchen table and photo galleries are zooming across our computer screens as Jeff and I reconnect after our separate paddling adventures over the past week. 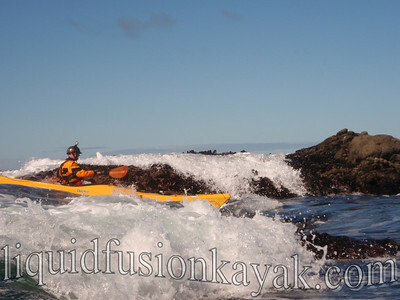 Of course our best adventure of the week happened when we both returned to the Mendocino Coast for a sweet sea kayak rock garden session with some special guests. 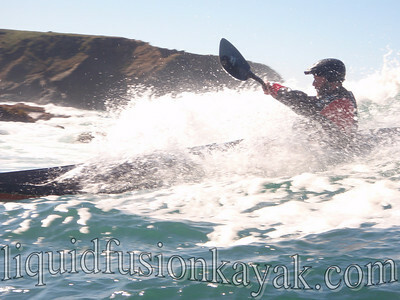 Jeff just returned from the Golden Gate Sea Kayak Symposium. He ventured down a few days early last week to take a BCU 4 Star Assessment (yes they were the group that was on the channel 5 news jumping off the sea wall). After the 4 Star Assessment, he was there for the weekend as an instructor in their rock gardening classes. Jeff had a great time. 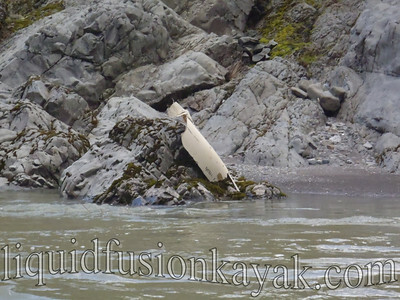 He passed his BCU 4 Star Assessment, got to coach paddlers in around the rocks, reconnect with old friends, and meet new ones. We are both stoked that Jeff had the winning raffle ticket for a new drysuit of his choice from Kokatat. Thanks for all the suggestions and comments that it should be a women's size small; however, Kokatat just gave my drysuit some love and I am happy to wear it for another season. Yes, last week was a drysuitless week for me as my suit was in the shop but not one that didn't see me on the water. 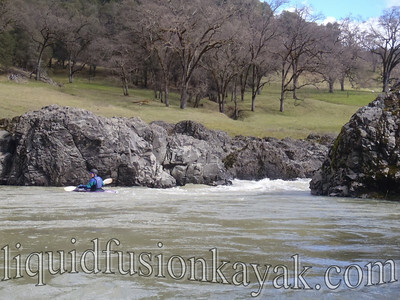 My adventures included focused work on our 2010 books in preparation for tax season (not the funnest adventure), teaching private sea kayak lessons, and playing with the Gold Country Paddlers on the Eel River. The 2 days on the Eel were fun as significant rainfall during the week had the river running at a moderately high level. 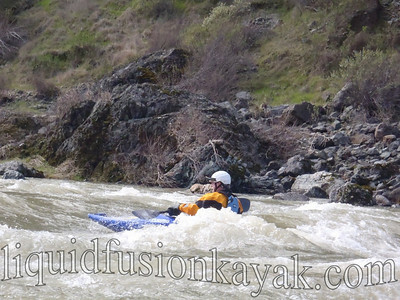 On Saturday, we did the Outlet Creek to Dos Rios Run at about 4200 cfs which made for some big waves and big hydraulics. Here's Jerry the organizer of the weekend doing a little river surfing. On Sunday, I joined the group for the Hearst Run - a 17 mile wilderness stretch. This is a Class II run with one Class III rapid that is known for good wildlife viewing. 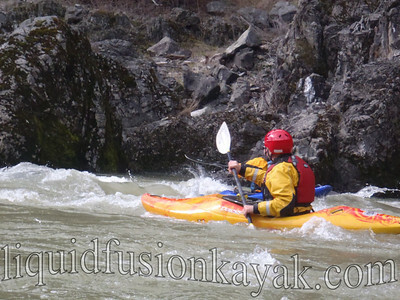 We were a chatty group and didn't see a lot of wildlife but it was a gorgeous paddle at a fun flow. 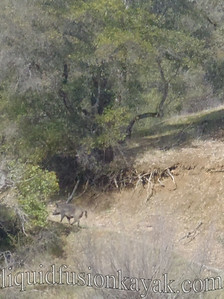 I was excited to get a photo of one of the wild boars that we saw trekking up the hillside. I also got a photo of the remains of a Wenonah Canoe on the banks. Geee . . . no roads around. I hope that they didn't have to hike out. The highlight of our week though was the unexpected guests that showed up at our house after the symposium. 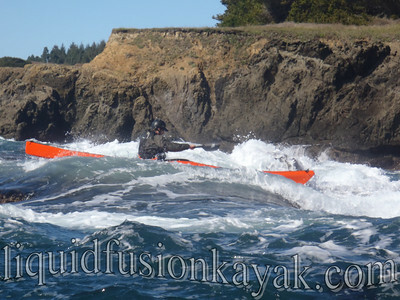 The guys had a great time paddling together and decided to indulge in a play day in the rock gardens of the Mendocino Coast on their way north. 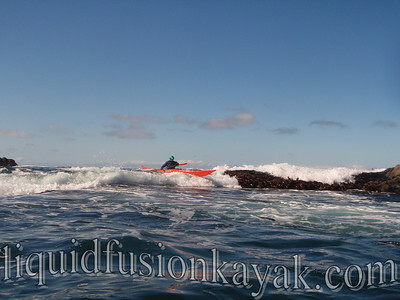 It was AWESOME to share our playground with such a talented group of paddlers. These guys definitely ROCK!!! A week of good fun!! !